TNTI, a leading supplier of refractory metal materials from titanium, nickel, molybdenum, zirconium, tantalum and niobium, boasts abundant industrial production and latest scientific technology. At TNTI, we always regard developing and manufacturing products of first-class quality and industry-leading functions as our top priority. Over 10 years of experience has equipped us with outstanding advantages in melting, forging, heat treatment, rolling and mechanical processing. 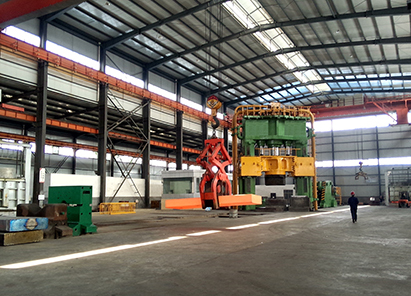 TNTI have advanced equipment, such as VAR furnace, vacuum annealing furnace, forging machine, 4500 MT open die forge press, straightening machine, sawing machine, CNC lathes, milling machines and other production equipment. We pride ourselves on a complete series of test equipment, ultrasonic flaw detectors, electronic universal (tension) testing machines, and metallographic microscopes, etc. Strong technical strength, first-class inspection method and scientific quality assurance system with product processing, manufacture, sales and service as a combination, ensure this company to provide high quality and quick service to customers. TNTI has built up a wealth of experience in not only selecting your most suitable material for an application but also in providing finished components. Regardless of the stage of your manufacturing cycle, either at prototype, pre-production or mass production volumes, TNTI can provide superior service in an all-round way. Our representative products are Titanium, Zirconium, Tantalum, Niobium, Molybdenum and their alloyed ingots, slabs, bars/rods, plates/sheets, pipes/tubes, forgings, fittings, wire, powder, standard parts, non-standard equipments and Custom Fabrications. There are no minimum order requirements, whether you are ordering ASTM F136 Gr 23 Dia 0.5mm medical titanium wire or Single five tons of Ti-6Al-4V titanium forgings block, you will all be welcomed as our distinguished customers. TNTI holds ISO9001 and test certification, which guarantee both our quality systems and quality products. Widely used in aerospace, medical, chemical, metallurgy, petro, valves, nuclear industry, chemical fiber, machinery, shipbuilding, electric power and other industries. Product quality is stable and reliable. TNTI Company, by continually increasing production capacity, competences, international presence and cooperation with our customers, we have been developing material accesses to future technologies all the time. We are ensuring our role as a strong partner both in this industry and relevant research. We not only provide qualified products, but also provide overall service like designing, solution and prompt delivery which are all aimed to gain full satisfaction from customers. TNTI has always prided itself on maintaining full document and batch traceability and providing appropriate analyses of chemical and mechanical properties with the materials we supply. We are committed to providing competitive products and services to our customers. At every turn of our business operations, we seek to implement processes that ultimately satisfy customers’ all-round expectations. We guarantee deliveries of metallurgical material according all available standards, e.g. DIN, ASTM, ASME, ISO, EN, GOST, NFA, API, BS, etc. Our company offers consulting service based on our deep knowledge of the quality and market prices of all the metallurgical goods and materials to help you improve project management. Our efficient team with advanced management experience promises to serve you with good quality, fast delivery, fair prices and unparalleled service, and offer free technical advice services as well. Our policies and decisions are designed to create long-term competitiveness and mutual success both of our customers and our own company. We are looking forward to cooperation based on mutual trust.